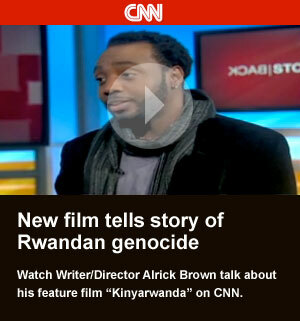 Kinyarwanda: 2011 Sundance Film Festival Winner World Cinema Audience Award, Dramatic. Written and Directed by Alrick Brown. Check out the writeup on IndieWire. You can also see the new trailer right here on our site. Check out the article on The Hollywood Reporter. Alrick Brown in "25 New Faces of Independent Film"
Check out Filmmaker Magazine's profile of Director Alrick Brown. If you're riding around in a NYC taxi, you might get to see Director Alrick Brown staring right back at ya. If not, we got the video right here. "Taxi Rider Series: Director Alrick Brown". AFFRM—aka the African-American Film Festival Releasing Movement—will give U.S. theatrical distribution to “Kinyarwanda,” the 2011 Sundance Film Festival Audience Award winner for World Cinema Drama. The film will be released in November .Learn more. Paste Magazine Review: "An ennobling film"
Check out the article "Sundance 2011 Reviews: Another Earth, Little Birds, Kinyarwanda". Check out the article "Faith Gets Star Treatment at Sundance". Full post / Comments. Check out the "Meet The Directors" interview with Alrick on IndieWire. Full post / Comments. Untold Story of Faith and Reconciliation to Debut in the World Cinema Dramatic Competition at the 2011 Sundance Film Festival. Full post / Comments. The 2011 Sundance film festival has just announced their lineup and we are absolutely thrilled to let the world know that we will be premiering in competition at Sundance in January! Full post / Comments. We are proud to announce that KINYARWANDA is one of the recipients of this summer's cycle CINEREACH GRANT. Congrats to all of the other filmmakers. Thank you CINEREACH & IFP for the continued support!!!!!!!! Full post / Comments. Our team is attending Independent Film Week. We are privileged to sit in on panels and meet with industry professional we may not otherwise have access too. It is a great place for independent filmmakers to connect, share, and grow. Full post / Comments. Also check out articles on other IFP lab films: I'M NOT ME, directed by Zak Mulligan, Rodrigo Lopresti and YELLING TO THE SKY directed by Victoria Mahoney.Full post / Comments. We are honored to be one of the 10 films selected each year to participate. Check it here. We are truly in good company. Please look out for the other films and filmmakers in the program. Full post / Comments.